In Hindu religion cow has attained the status of holy mother worthy of worship. Kamdhenu is a miraculous "cow of plenty" who provides her owner whatever he desires and is often portrayed as the mother of other cattle as well as the eleven Rudras. 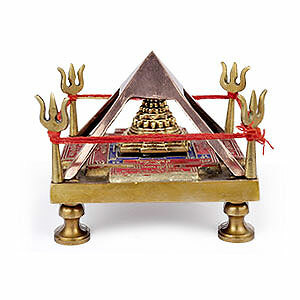 The religious belief behind it says that it originated from SamudraManthan. It has attained greatest place in Hindu religion. Cow is considered equivalent to Goddess in Hindu Religion. It is believed that cow is the abode of 33 crore Gods. That is why cow is worshipped on all special occasions in India. The Sringar(makeup) of cow is done with the wings of peacock. Cow is considered holy and worth worshipping in Hindu religion. According to Shastras the auspicious results of cow service (Gauseva) is attained in several rebirths and that is why Hindu religion emphasises the philosophy of cow service. Kamdhenu cow is Prana (life) of Hindu Culture. It is worshipped like holy rivers and scriptures. Kamdhenu cow is the mother of all living creatures. All Hindus respect cow as the symbol of Hindu religion. 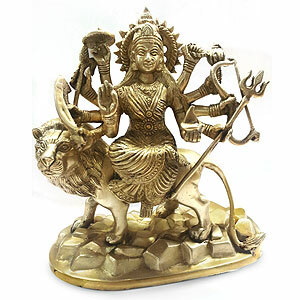 Kamdhenu cow is the mother of divine qualities and on earth it is equivalent of Goddess. 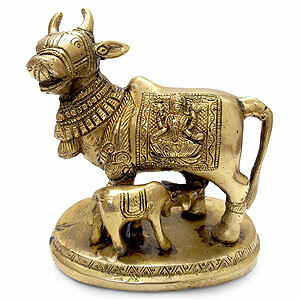 Kamdhenu cow idol along with its calf is the symbol of prosperity and Vatsalya (love that a mother feels for a child). It can be placed in the room of children and guests. 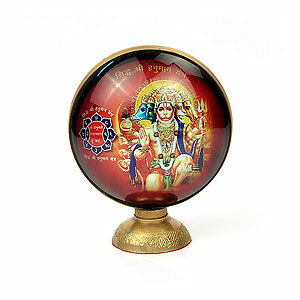 With the impact of it children become obedient and auspicious Sanskaras are inculcated in them. 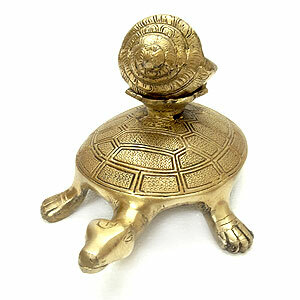 So it is highly auspicious for enhancing the good luck of your house.